This small waterfront park is located in the northern part of Old Town between Pendleton and Madison streets. The park is the site of the annual Alexandria Red Cross Waterfront Festival, usually held on the second weekend in June to celebrate the history and vitality of the Alexandria waterfront. Visiting tall ships, fireworks, arts and crafts, concerts, and children's events are just a few of the highlights of this popular festival. For more information, call 703-838-5005 or 703-549-8300. Oronoco Bay Park is also the site of the Dee Campbell Rowing Facility, operated by the city for the TC Williams High School Crew. 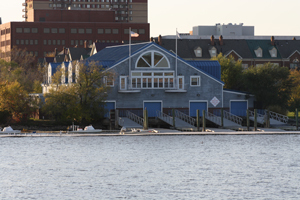 It is also used for adult rowing programs in Alexandria.